Group Texting offers a variety of features that collectively comprise a powerful, yet easy-to-use platform. Take a look at the list below to get an idea of the essentials. 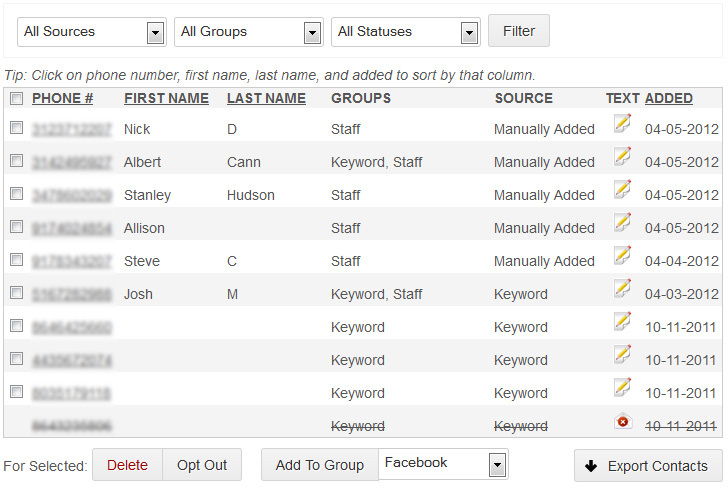 Quickly and easily add contacts to your account by uploading a spreadsheet from your computer, copying and pasting from another document, or typing them individually. Once you begin promoting a Keyword, contacts will be able to use that Keyword to automatically opt in to receive messages from your account. 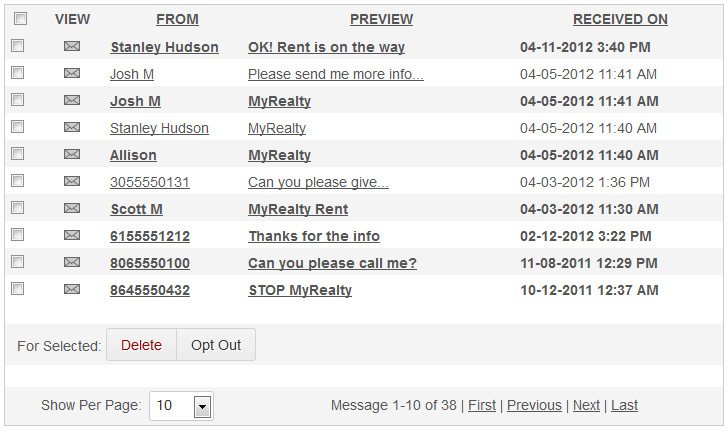 It’s a safe and convenient way to monitor who’s opting in and out of your list, in addition to when they’re doing so. When contacts opt out, you’ll see that their names have been crossed off the list, and when they opt in, you’ll see their names and numbers, along with the date they joined. Organizing your contacts into Groups makes it easy to manage your SMS communication. 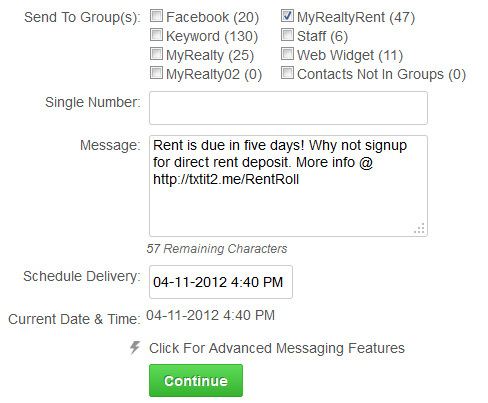 Each contact can belong to as many Groups as you’d like, and you can select multiple groups when sending a message. Simply click “Create Group,” choose a group name, and and save it -- three simple steps to unlimited messaging flexibility. Once you have contacts and you’ve organized your Groups (if needed), you’re ready to send messages. It’s a quick and easy process: select the Groups you’d like to send to, type your message, and either send it immediately or schedule it for a future date. You’ll also have the option to upload an image that will display as a link to your recipients; when they click the link, they will see your image. When you send a message, your contacts are able to respond for up to twelve hours. You’ll be able to easily identify unread messages -- indicated by bold text -- and you’ll be able to monitor the date and time at which the message was received. Additionally, you’ll have the ability to manually opt out recipients, if needed. When you need an easy way to receive your Inbox messages on the go, Message Forwarding is your solution. Simply enter the email address or phone number to which you’d like to forward your Inbox messages, and you’ll be able to receive them when you’re away from your computer, as a text message or email. If you’re a developer, you can utilize our API, which allows you to forward Inbox messages to a URL. Click here to learn more about our API. 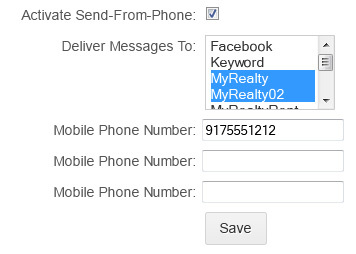 Once you have a Keyword set up in your account, you’ll be able to use Send-From-Phone, which allows you to text specific Groups of contacts directly from your cell phone. To configure this, click on the Send-From-Phone menu item in your account interface, choose the Keyword you’d like to use for sending messages, and the Groups you’d like to send messages to. From there, you can authorize up to three phone numbers to send outgoing messages from your account. This feature makes on-the-go broadcasting a snap.